I did it! I used Terry Pratchett’s “scaffolding story” process. The first draft of the alternate history romance Wealthgiver took exactly a month to finish. I am quite excited that Tantor Media (Tantor freaking media!) 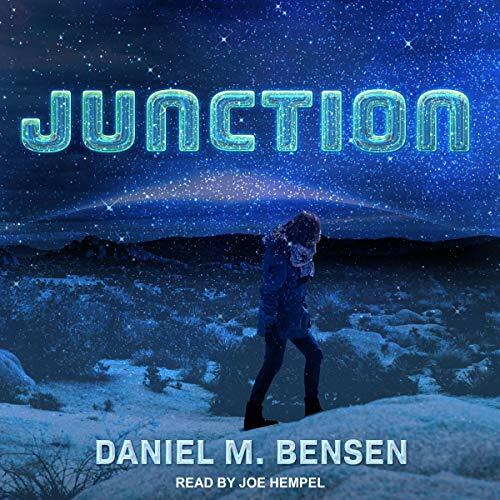 has recorded this audiobook of Junction. "When Japanese nature show host Daisuke Matsumori finds himself on an alien world, he hopes to rekindle his passion for his work. Traveling through a newly discovered wormhole in the Papuan highlands, he joins biologist Anne Houlihan on Junction, a patchwork planet of competing alien ecosystems. Yeah. There are some mature themes. BTW: The reader, Joe Hempel, is great. His questions about the correct pronunciations of people's names led me to discover that actually I'd been pronouncing some of them wrong. This is why audiobooks are important. You can find the audiobook on Audible, the Tantor website, or Amazon. Junction is out! You can buy it at Amazon, Barnes and Nobel, and everywhere else in the Anglosphere. Soon, we shall invade the other spheres, as well. 240 pages, ~90,000 words, first line: Daisuke Matsumori faked a smile and held out a dead mouse. The little corpse dangled by its tail, its eyes closed, its toes clenched, observed by the cassowary. Thank you, everyone, for staying with me on this long and wild ride. The Centuries Unlimited (beta) is done! Just in time for the boredom of the vacation (ugh, right?) The Centuries Unlimited is a noir time travel/family saga with flying gangsters and hope. And I want to know what you think of it! Tell me if you want to be a beta-reader and I’ll send you the whole damn thing. Alright my friend, I had an idea last night that reminded me of one of your KoE musings so I thought I'd share it with you and see what you think. I was watching Star Trek, trying my best to ignore the "planet of hats" trope they beat to death, when it occurred to me that, with a little tweaking, that trope could actually make for an interesting setting. Assume for a moment that humanity joins the galactic community and discovers that nearly all alien civilizations are indeed planets of hats: more or less culturally homogeneous, as it were. The reason for this is that, for the vast majority of intelligent species, cultures fight for dominance until one comes out on top and assimilates all the others on their homeworld. The galaxy is a violent place as they take this tenancy to the stars and humanity, as the only known "culture of tolerance" is indeed unique for their diversity of thought and lifestyle. In other worlds it's a universe full of planets of hats, and the hat humanity wears is tolerance towards different cultures. Cool! Sorry it took me so long to respond, but I wanted to give your idea time to cook. There's actually a series similar to what you're talking about: Alan Dean Foster's A Call to Arms. He says humans are diverse (with different languages and everything!) because of our moon, which churned up our planet's core and kept our tectonic plates from forming a super-continent and sticking there. I've been toying with a similar idea, myself. Imagine a political union like the UN, whose purpose is to stop wars-of-extermination (which turn out to be the most common form of inter-species relationship). The space-UN doesn't want to get bogged down in intra-species politics, so its rule is that it only deals with ONE representative polity per species. So Earth gets represented by China, giving other species the impression that humans=China. Other species have the same problem. They all wear a hat, even if it doesn't fit. In your scenario, what's different about Earth that we didn't go the way of the rest of the universe? Well I was reading about habitable planets and a lot of scientists these days seem to think that, based on what we know about exoplanets currently, Earth-like planets will likely be "all or nothing" when it comes to water: they'll either have a surface mostly covered in water or be Tatooine-style "desert planets" with little surface water. I'm not sure to the validity of this idea but it got me thinking that without large oceans separating landmasses there's really not much stopping empires from expanding their borders to the point that they dominate the whole planet. Similar to the situation between the humans and the Race in Turtledove's World War series, I suppose. Humans have such tolerance because of our sheer diversity, which is in turn caused by isolation of various groups for long periods of time.